I honestly can't believe that it's almost Canada Day! It seems as though time has been passing at warp speed since February, no? I love, love, love Canada Day. Growing up in the Nation's Capital was such a treat, hopping on an OC Transpo bus and celebrating among thousands of other proud Canadians and ending the evening with an absolutely amazing fireworks show. Seriously, so many memories. The weather is typically fabulous. Hot, humid and oh so Ontario like, so you definitely want to have some summer treats and meals to keep you and your fam-jam energized. This recipe by Canadian Living is my Canada Day go to. Truly delicious...no leftovers kind of delicious. I highly recommend giving it a try, trust me, you won't regret it! I mean seriously, strawberries and whip cream...can't go wrong! 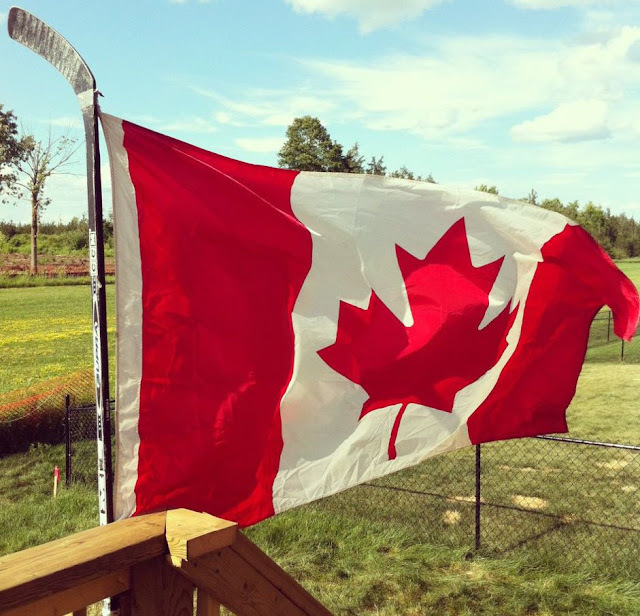 Nothing is more Canadian than the flag on the hockey stick. Haha love it!